Alright folks. I’ve been looking for time to write this article and it looks like this Sunday/Monday is it. 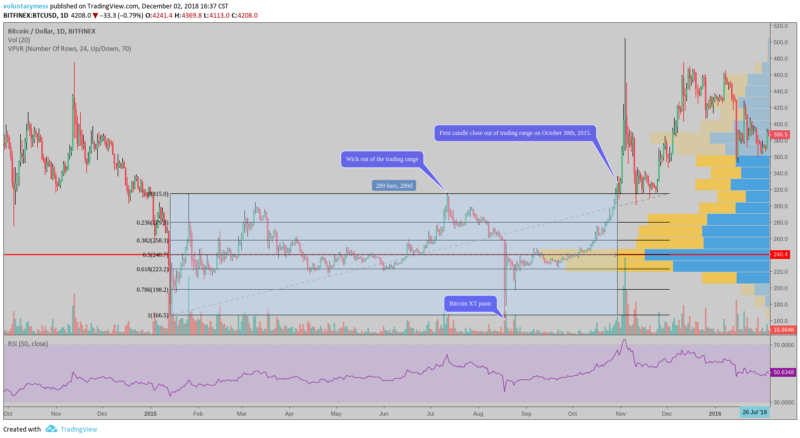 I am writing this to take a brief look back at bitcoin price action over the last few months and the market cycle moving forward. This article will be purely to review price, but I never ever want to discount the phenomenal things happening from a fundamental level in this space and particularly with the Bitcoin Protocol. With the implementation of the early stages of the Lightning Network, Liquid, and increasing adoption of SegWit it appears that Bitcoiners are really cooking with gas. Not to mention we lost a bit of weight over the last year and the bod is looking fantastic. So. Is the bottom in yet? I don’t know. I have absolutely no idea, and anybody that says they do is either a liar or holding enough bitcoin to prop up or push down price. If you find the latter, let me know. However, I’m going to proceed with this article as if the bottom IS in. The Bitmex order book logged a low of $3430 in the early morning hours of November 25th. Depending on which exchange you’re using it appears the low was somewhere within about 200 points of this number. Over the next several days, this price level was tested a few times with wicks dropping below $3600 four additional times (on the hourly) but each time being rejected and pushed back up. An hourly candle has not closed below $3600 since the low on November 25th. If the low is in, it looks like the fractal comparison with the 2013 runup/rundown is valid. See my medium post about the comparison of this cycle with the 2013 cycle, published on July 13th if you’re interested. I highly recommend reading since I wrote it. Nothing fancy to it, just a rough comparison using times, fibs, and percentages. But it appears to have been quite accurate in predicting the low (if the low is in, which it may not be). The analysis I used predicted a low of $3439, so around $9 off. Good enough for government work. And please ignore the fact that this analysis was done using a Bitfinex chart instead of Bitmex :). Over the course of the next month or so, I refined my “target box” to somewhere between 3400 and 3600 and that has certainly hit. The bounce off of the lows has been a bit low-volume for my liking and I can’t quite shake the fact that there may be another lower low (read: buying opportunity) incoming. If the dump into the $3400’s had been on high volume in a typical capitulation-style event, I would feel much more comfortable going long and walking away. However, there’s been quite a bit of goofy price action and I’m not sure our Composite Man is satisfied with the number of floating chips still out on the table. In any case, let’s see if we can get any clues for the next few months using our old fractal, since it appears to have served us well in predicting this price action. Setting our starting date at the low of the 2013 cycle, $166.50 on January 14th of 2015, we can see that the price stayed range-bound for 289 days. The range being defined as the area between the low, $166.50, and the high set off of the automatic reaction, $315. 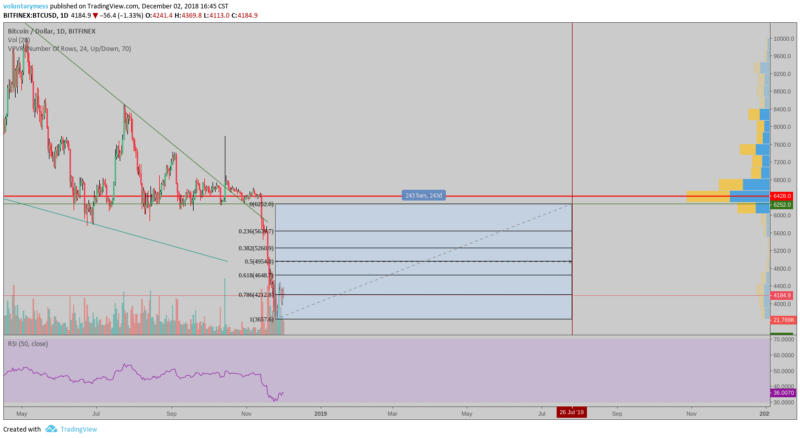 From the chart we can see that the price remained within the 62% Fib retrace and the top of the range for the majority of this time. It wicks out briefly on July 12th of 2015 but quickly dives back in. The only other notable price action is the panic dump which wicked out of the trading range during the launch of the Bitcoin XT client, interesting only in the fact that it was the first real outcropping of the block-size debate, receiving quite a bit of media coverage including articles in The Guardian and Wired. This occurred in August of 2015 and the real panic set in (if I remember correctly) when the first XT block was mined. You can see a High Volume Node dead on the 50% retrace of the automatic reaction off the low. This was a grind; it was a long dead year in terms of price action. Bitcoin finally closed a candle outside of the range on October 30th of 2015. It ramped up quickly then re-checked the range and away we went. Of note, this was around nine months before the last block reward halving in July of 2016. So let’s translate this to now. First, let’s take a look at the ratio between the previous bear market and this one with respect to time. I’m not going to print a bunch of charts clogging this thing up so you’ll have to trust me: high to low in 13/14 took 406 days. The present run-down has taken 343 days, or 84% as long. I’m working this out as I’m writing, and holy smokes that’s the EXACT percentage of the price decrease from high to low in the last market cycle. That is really spooky and cool. Jeez. Alright, back to business. If we assume that the range-bound portion of the cycle will last 84% as long as the last one, it should last 243 days. This takes us to July 26 of 2019. Again, this is all voodoo Technical Analysis so take it for what it’s worth, which may not be much. But be prepared for a grind; be prepared to accumulate and learn for another eight months until the next candle closes above the trading range. You may be looking at the chart and wondering why I set the upper bounds of the trading range at $6252 and the answer is that it’s the last strong level of horizontal support, no other real reason. The real trading range will be set off the reaction from the low. So there you have it folks. IF the bottom is in, here’s my prediction. We break out of the “trading range” in July of 2019. I’ve consulted several Shaman, rubbed all of the tea leaves together, and summoned the spirit of William D. Gann using candles and a trend-line pentagram drawn on a chart of General Motors stock from 1923–1927. I feel like it’s fairly accurate but now Ghost Gann follows me around my house in the evenings. I’ve done it all for you, the reader. And if we put in a lower low, well then I’ll do it all over again. As we move forward into the next bull market, hold strong and remember the ONLY REASON TO BE TRADING IS TO ACCUMULATE MORE BITCOIN. If you’re losing Bitcoin, either lengthen your time-frame, lower your leverage, or just buy and hodl. I have a hodl bag that I will never trade and I encourage you to as well. If you think the ICO’s of this last cycle were tempting, there will be even stronger sirens along the path. Do not be distracted, get bitcoin and keep it. Operate as if every single person in this space is a scammer. Every single person, even me. ESPECIALLY ME. Here’s the thing about Bitcoin, it’s like the Great Reformation or something. I’m not religious, but the one where everyone realized “holy moly, we don’t need people between us and god we can just talk to him directly.” That one. There is no person preventing you from acquiring Bitcoin and holding the private key. If you’ve been in the space for more than about a year you know that there are about 3,000 people at any given time jockeying to be some sort of “gatekeeper” of knowledge, and you have to do it their way. Well you don’t. You have to do it YOUR way. You GET to do it your way. They may know more than you do but you don’t need to know much to acquire Bitcoin and keep it safe. Get bitcoin. Hodl bitcoin. Learn about Bitcoin. Read books. Run a node. Don’t trust people. Don’t trust me. Check my BlockDelta profile for additional articles.